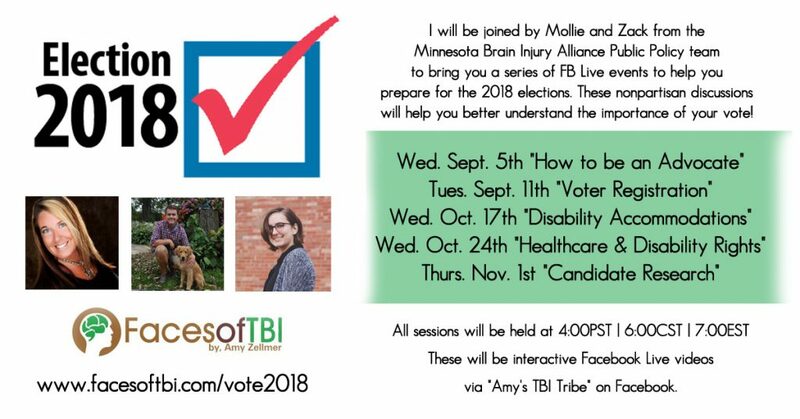 I will be joined by Mollie and Zack from the Minnesota Brain Injury Alliance Public Policy team to bring you a series of FB Live events to help you prepare for the 2018 elections. These nonpartisan discussions will help you better understand the importance of your vote in the US elections! You must be a member of “Amy’s TBI Tribe” on Facebook to participate in the live events …. replays will be posted here on this page and also sent out via email if you are subscribed to my newsletter. handout for this video click HERE. handouts for this video click HERE & HERE. Thank you so much for sharing this important information!